The Mosman Design Awards presentation evening once again was a big hit with the nominating architects, owners and judges that attended the event on 6 March 2017 at the Mosman Art Gallery. This home is a beautifully crafted architectural experience from beginning to end. The street presentation is quiet and humble yet elegant. This is a lovely introduction to the interior which is dramatic, dynamic and multi-layered. The home is conceived as two pavilions arranged on each side of a deep courtyard with a large terrace. The swimming pool, conversation pit and garden are at the rear. The front pavilion contains mainly bedrooms and amenities. The rear pavilion contains a variety of living spaces and a large study. The connectivity between the spaces on each side of the courtyard is a delight, as is the ability for all spaces to gain excellent access to light and views of one sort or another. The courtyard is a source of ventilation and cooling for the home and performs well. It is also ornamental insofar that is has a garden at the base and the side glazed wall to the building has a powerful copper screen element from top to bottom. The circulation spaces of the home are consolidated along the eastern boundary and are generous in proportion. 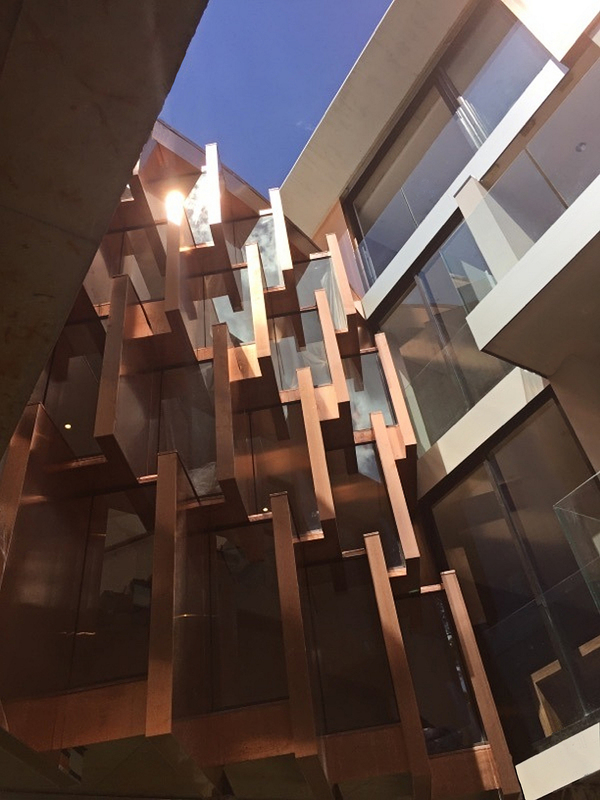 These areas also benefit from the light from the courtyard and an interior version of the aforementioned copper screen. 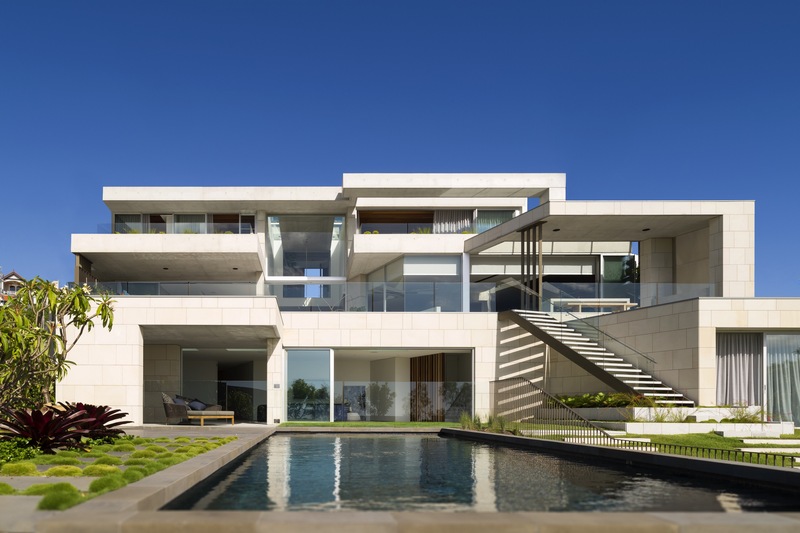 The architecture is carefully sculpted to take best advantage of light and views, especially side and corner windows which splay and deconstruct to frame landscape elements and offer light relief to the otherwise solid structure. The secondary living area on the bottom level of the rear pavilion has a lofty grandeur which is offset by the use of warm interior finishes, details and substantial exterior screening elements. It’s a lovely surprise to look back at the home from the garden as after the immensity of the interior experience one expects the exterior form to be massive. Instead it appears to have a small and carefully crafted scale, sitting comfortably in its landscape and among its neighbours. Sustainability has not been taken lightly. 10 × 10kw batteries are powered by 27 solar panels. There is 30,000 litres of rain water collection, planted roofs and careful management of solar access and thermal massing. The interior design is very well thought through and the details well executed. The construction quality is very high throughout. Overall, this home is an ambitious and complex project that has been handled with care and grace. It is an exciting piece of architecture yet at the same time and most importantly feels like a home for a family. The house showcases a strong, robust architectural character that cleverly expresses and celebrates its materiality. 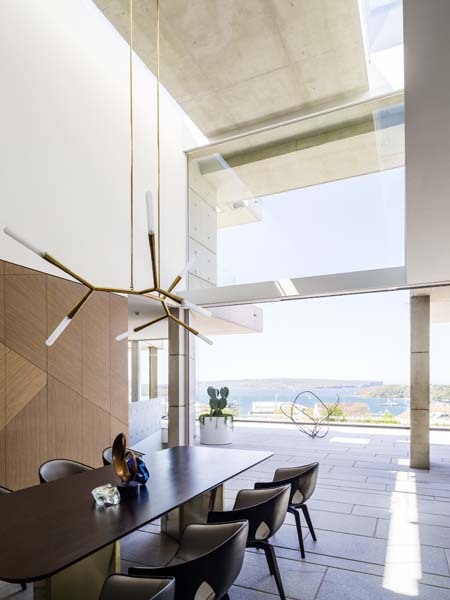 The layering and intersection of each floor enables the house to not only manage the steep slope but use it positively to create generous, lofty, light filled double volume spaces in strategic locations such as the entry experience which focuses the eye to the view. 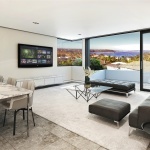 The design engages almost every room in the house with the magnificent view. The positioning of the house and the orientation of the outlooks also means that there is little awareness of the neighbouring properties from within the house. 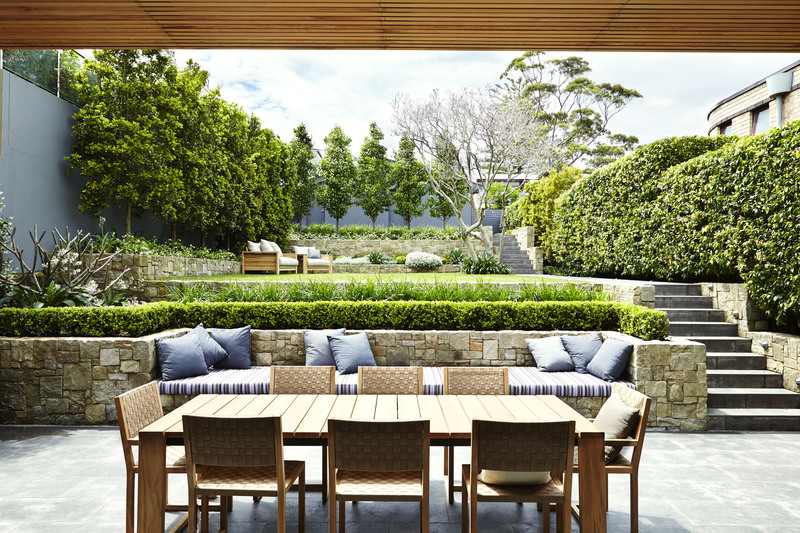 Generous entertaining spaces are provided internally and externally allowing a seamless connection to the secluded garden and decked areas. The facade appears to dissolve by the clever use of bespoke glazing and void spaces so that one really loses perspective of where the intersection of inside and outside occurs. The cool colour palette created by the extensive use of concrete and pristine white double height walls has achieved a serene and peaceful environment. 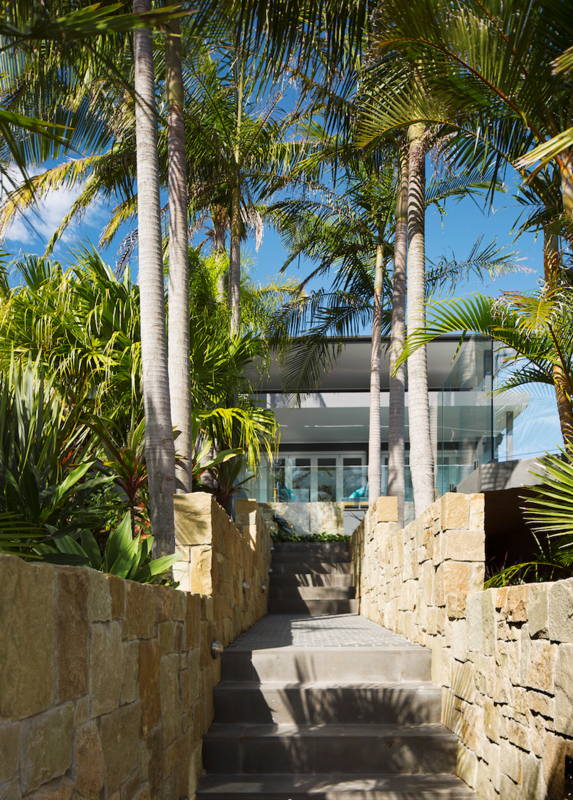 The exceptional care and attention to materials and detail has ensured that all aspects of the house contributes uniquely to the quality of the architecture and form. 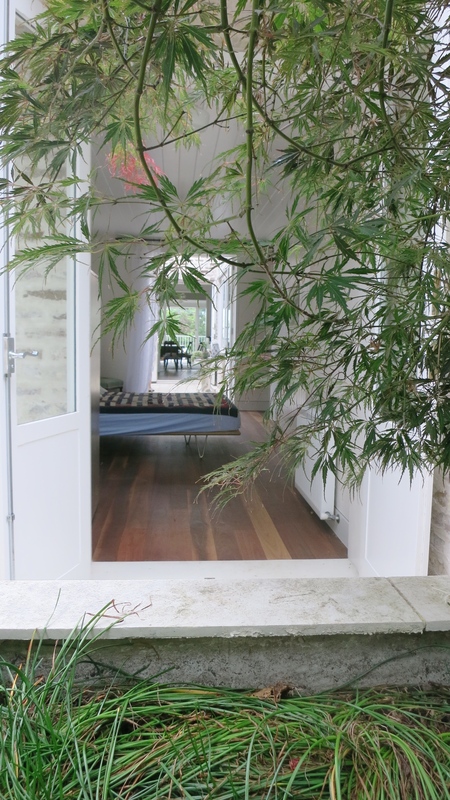 28 Burran Avenue is one of the most liveable, simple and elegant homes we visited this year. It is discrete on approach and has a seemingly compact form on the site. The entry has a lovely human scale which sets the tone for the main living level which is generous yet always feels homely. The functionality of this home is excellent throughout however this is most exemplary on the living level which is hard to fault. The amenity areas are dealt with efficiently and discretely, leaving the kitchen, lounge and dining spaces free of clutter. The main stair connects all three levels and offers good natural light to the living spaces. 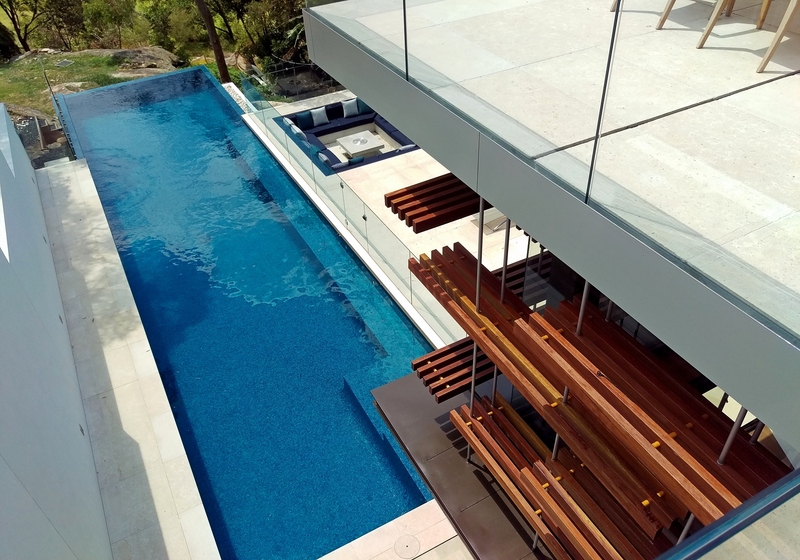 Cantilevered roof elements increase the sense of connection to the views while providing outdoor covered spaces unspoilt by columns. The architectural materials and details are well handled resulting in a ‘clean’ expression of the architectural form. Likewise the interiors are well delivered, using warm materials, simply curated resulting in an elegant but relaxed experience. This project demonstrates substantial design skill and sensitivity in achieving an outstanding renovation and re-styling of an existing Inter War bungalow style property sited on a prominent corner site in Clifton Gardens. The owners desire for achieving the ‘Hamptons’ feeling has been admirably carried out with a remarkable consistency of detailing throughout, and does not appear foreign in the Mosman context. The house sits well with its neighbours and contributes significantly on this prominent corner location. The original Arts & Crafts / Bungalow House had previously had a bulky and unsympathetic roof top addition that detracted from its original form and character. 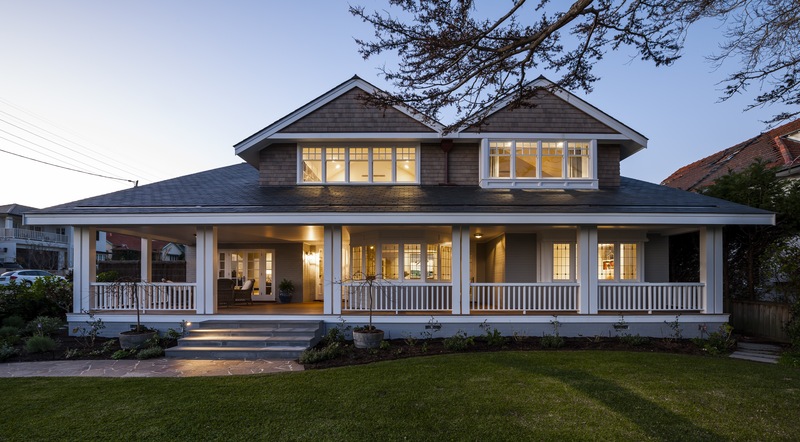 The architect has cleverly created a new roof form with sympathetic gable to the front and dormers to the rear that is typical of East Coast American Bungalow design. The detailing of the new slate roof and shingled gables is beautifully executed to provide a simple, yet artistic presentation to the public domain. This presentation is enhanced by the new landscaping, fencing and the deep verandah under which the original section of the house shelters. 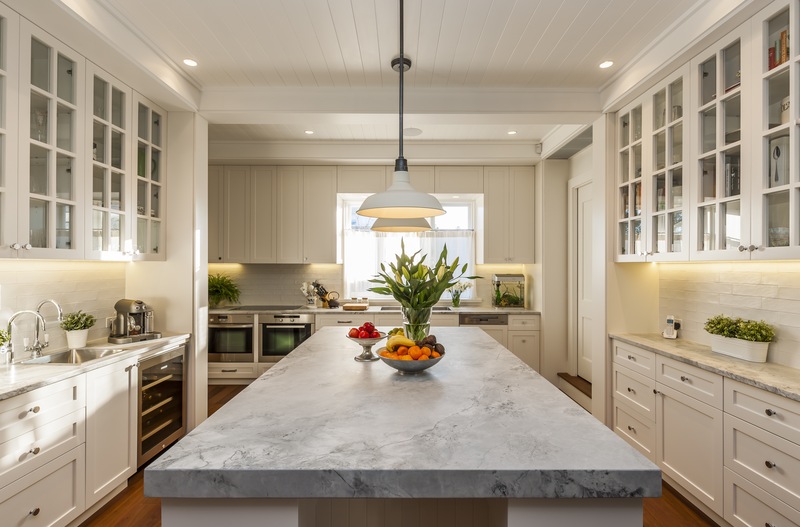 The quality of design resolution carries on throughout the interiors where replanning has achieved a functional design for family living, retaining the best of the original and creating new work that is sympathetic to the age and character of the house. 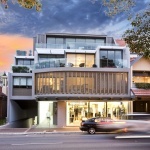 The concept for this house is straightforward and unpretentious. The simplicity of the approach and solution was refreshing and openly honest in its expression and materials. The modest budget was cleverly managed to meet the client’s needs whilst also solving the common problems of spatial flow and light penetration for two storey semis. Integral to the design philosophy is sustainability. The positioning of the central courtyard and the way rooms engage with this space and the rear garden maximise opportunities for natural ventilation and light penetration. The courtyard (created from the original living room) becomes the hub of the house as well as providing a major source of outlook, light and air, and the retained fireplace provides both a focal point as well as screening services for the dwelling. 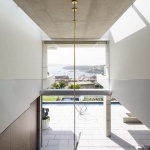 The visual connection from the front of the dwelling to the rear exaggerated the available space making the dwelling feel more expansive and spacious than normally associated with semi-detached dwellings. The materials used in the adaptation continues this integrity with the unpainted plaster and use of Australian timbers notable in creating the internal ambiance of the house. The finished house has provided an interior that delivers an adaptable backdrop or canvas for a lifetime’s worth of furniture and collectables. This project comprised the extensive replanning and physical reconfiguration of an existing late twentieth century house of unremarkable character. The outstanding feature of the existing house was its location, with extensive views to Middle Harbour and a relatively large rear yard. The architect has unlocked the potential of the previously enclosed and compartmentalised house to take advantage of both the views and the amenity of the rear yard and connected both with light and airy open planned living areas on the ground floor, achieving a very liveable home suited to the needs of the owner’s family. The award winning rear garden provides a natural extension of the living areas that is private and has been treated in a manner that provides a beautiful contained outlook from within the house. 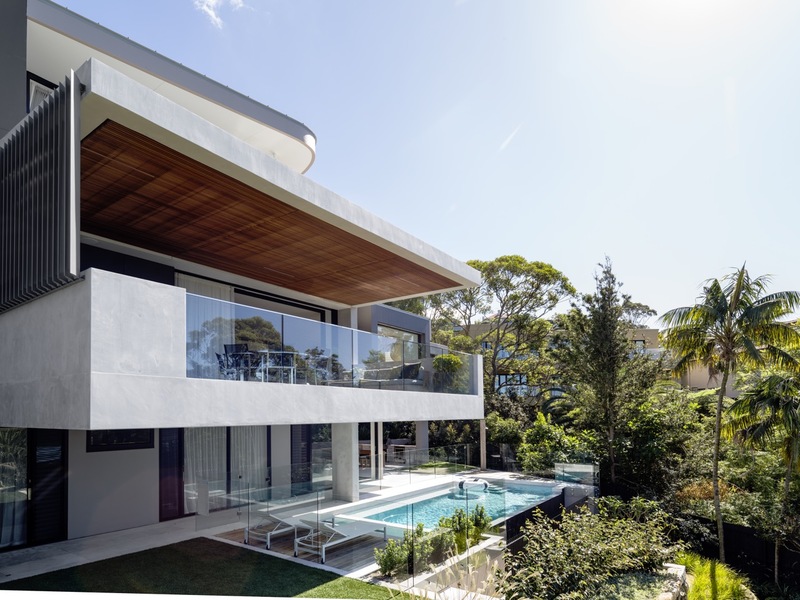 The design has substantially improved the environmental performance of the house and utilised the bulk of the existing building fabric in a responsible manner. 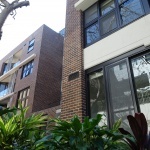 The renovated building sits very comfortably in the context of its neighbours and makes a substantial contribution to the built environment of Mosman.